Vancouver is a pretty special place. I’ve never lived anywhere with such a concentration of companies producing really good quality food products before. I don’t know if it’s to do with being close to LA, Portland and being on the west coast but there’s something about this city that stimulates the development of natural, plant-based products. The vegan movement is strong here and there is a huge market for plant-based cheeses, snacks and dairy-free dessert alternatives, to name but a few. I’m lucky enough to know some of our local producers and these people make me proud – proud to live in a forward-thinking city where the boundaries around conventional food are pushed, and proud that the terms ‘vegan’ and ‘plant-based’ are becoming more accepted by mainstream grocery stores as they stock more and more innovative products. Regardless of whether you’re vegan, vegetarian or just looking to cut down on dairy, these products are for everyone and aim to be inclusive as well as delicious. Which brings me to this week’s recipe. I recently met the lovely Jillian from Amai Vegan Treats and was lucky enough to get her to agree to collaborate on a recipe with me. 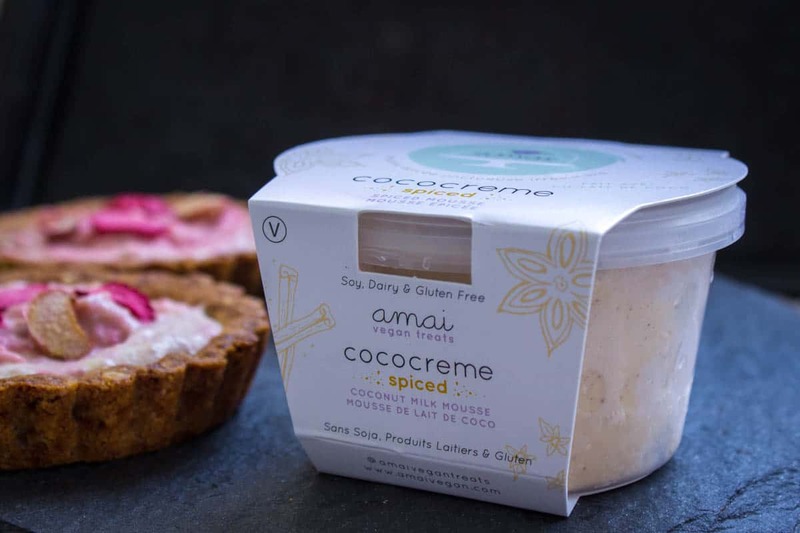 Amai make incredibly decadent and rich cakes and mousses which taste amazing but are all completely vegan, gluten-free, soy-free and refined sugar-free. 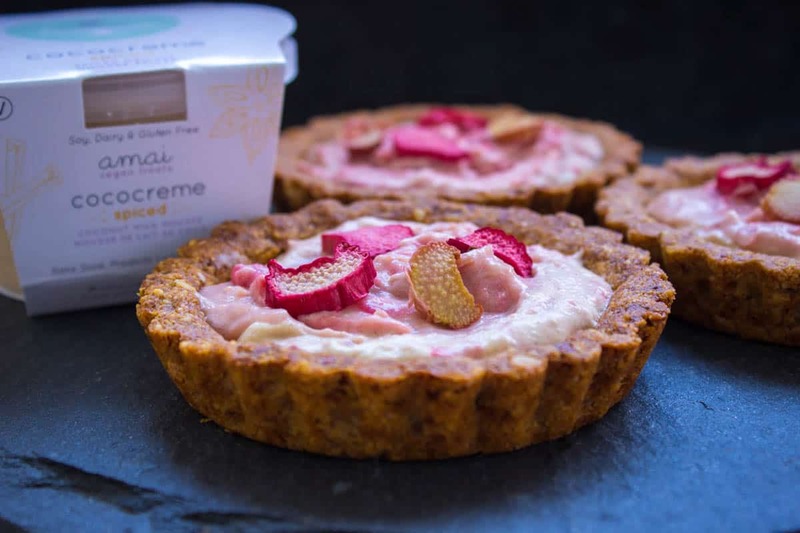 Their Cococreme is a coconut-milk based mousse that is light and airy yet indulgent, contains only six ingredients and is sweetened only with natural organic coconut sugar. The newest addition to the range is Spiced Cococreme – a mousse lightly flavoured with pumpkin spice – which tastes delicious as a creamy accompaniment to fruity desserts (or on its own!). I’m a huge rhubarb fan, and as it’s rhubarb season it seemed only fitting to create a recipe encompassing the two. 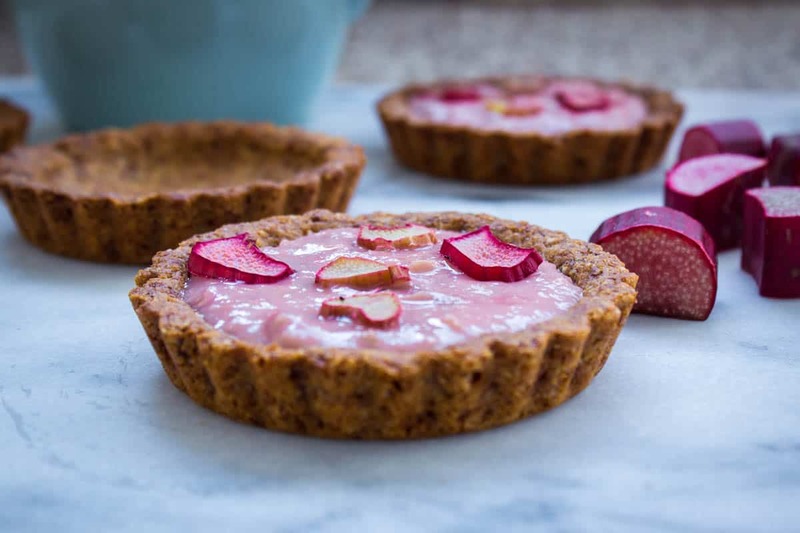 These Spiced Rhubarb Tarts pair the sharpness of rhubarb with the sweetness of an almond-oat crust and the creaminess of Spiced Cococreme. I’ll be honest – I like my food to look pretty as well as being delicious, and this recipe delivers on both counts. These tarts are fairly simple to make but with a little extra attention to presentation can look really beautiful (see method below). And of course as with all my recipes, they’re vegan, gluten-free, refined-sugar-free and are made from mainly whole food ingredients. A note on ingredients – as with all my recipes, I recommend using maple syrup or coconut nectar for liquid sweeteners, but am aware that these aren’t easily available in some countries. Feel free to use your own favourite liquid sweetener – I’m a fan of date paste and agave nectar as alternatives. Note: if you don’t live in Vancouver BC and aren’t able to get your hands on Cococreme yet, you can substitute ½ cup of homemade coconut cream – see my quick recipe here. Just add in a pinch of spices such as cinnamon and ginger, and you’ll be good to go. Preheat the oven to 175°C/350°F. Using melted coconut oil, grease 5-6 4-inch tart tins (you can find these in kitchen stores). Mix the oat flour, ground almonds, coconut oil, coconut sugar, cinnamon, ginger and vanilla in a large mixing bowl until the mixture resembles breadcrumbs. Add in 1-2 tbsp water and mix to a dough. Divide the mixture between your tins, pressing it into the sides and bottom of the tin (you want to create a shell to hold your tart filling, so ensure there is a hollow space for the mixture. Bake for 15 minutes, until bases are golden. When you remove them from the oven, you may notice that the tart bases have risen quite a lot – this is normal. Using the bottom of a dessert spoon, gently push the bases back down to ensure you maintain a hollow for the filling to go in. After 10 minutes turn each base out onto a wire rack to cool. To make the filling, gently heat the rhubarb and maple syrup on a medium-low heat in a saucepan, stirring frequently until the mixture begins to bubble gently. Continue to cook until the rhubarb has softened and disintegrates when touched with a spoon (about 10-15 minutes). Remove from the heat and allow mixture to cool completely. 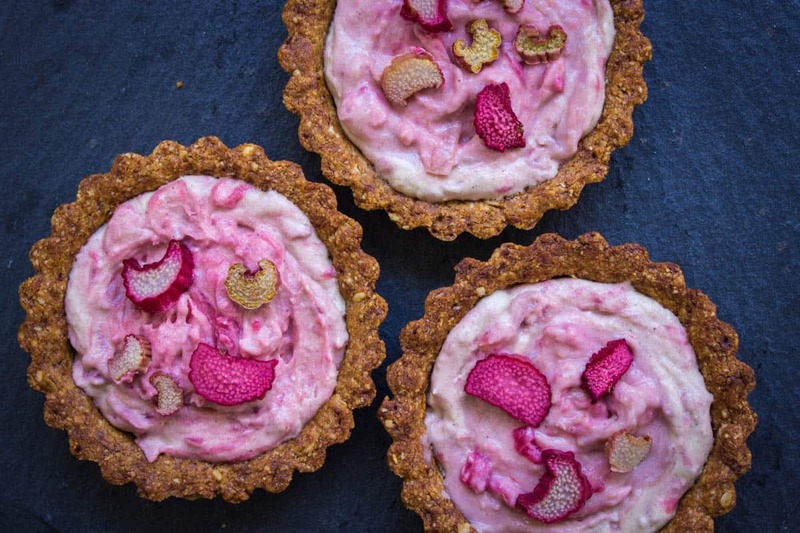 To decorate, I recommend placing thin slices of rhubarb on top of the tarts as they look so pretty. You can soften them by placing them on a baking tray in a warm oven for a few minutes. This will get rid of any crunchiness but will retain their flavour. I bet the rhubarb and coconut are delicious together, they certainly look delicious!